Step one: get into law school. Step two: Leave law school in order to preserve your family’s Filipino-American legacy. Easy, right? Chef Manuel Ramirez III, his broad forearms resting on a table at his Metreon eatery Inay Kitchen, strikes me with his calm, matter-of-fact manner as he recounts his story. “I was in law school at USF, and then we had an illness in the family: my father passed away and my mother was falling ill, so I had to handle the family business,” he tells me over the the din of a Friday afternoon movie crowd at the Metreon. A matinée showing of Wonder Woman has just let out, and a small crowd is forming around the windowed grill at Manuel’s restaurant, Inay’s Kitchen, smoking with the intoxicating smells of barbecue pork sticks. Some in the crowd point as fire licks up and the meat sizzles, the grill-man casually leaning back to duck the flames. Manuel smiles slightly at the sound of happy customers, and tells me how food has always formed a part of his family’s identity. That good run is continuing at Inay Kitchen. With his mother as a partner, Manuel and his crew serve up a full spread of fragrant, traditional Filipino fiesta dishes -- think Bicol Express, Sisig, and Pancit Palabok -- in a Metreon environment that otherwise evokes plainer, paper-wrapped fare like hotdogs and sandwiches. Manuel explains how this restaurant reflects his family’s dinner table discussions about the comparative dearth of Filipino restaurants around the City in the ‘80s and ‘90s. I notice a steady stream of customers flowing from the theater exit and toward the smoking barbecue. Most of them are young and look like they are on vacation, but there’s also a good amount of professionals in line, taking a late lunch. Manuel explains how important it was to his mother that the food reflect her philosophy of Filipino cuisine -- one that seeks to welcome newcomers to the flavors of Filipino food without compromising classic approaches. “Our whole mission statement was to create a business that could help expose Filipino cuisine to the person that’s had it maybe once or twice at a party, or never had it before. But then, at the same time, make a product that Balikbayans, or people who grew up eating the food, or people from the Philippines, can feel is a real representation of the culture. We wanted to be in a mainstream [location] but we didn’t want to be Panda Express -- and my mother was passionate about the idea that we can’t give people Filipino food for the first time in their lives in a tortilla,” he says. Fulfilling the vision of the elder generations is very important to Manuel, but he’s also adaptable, offering dishes like lechon nachos and sisig fries -- a nod to the carne asada fries popular in southern California -- alongside his traditional turo-turo menu. He explains how these decisions tie into his own personal history with Filipino cuisine. But he’s also firmly committed to developing the palettes of those less familiar with the dishes on his menu. Judging by the long line forming as we wrap up our interview, he’s succeeded in doing that. And he’s confident that UNDSCVRD can provide an even greater sense of the cultural learning experiences he and his mother have sought to create at Inay Kitchen. 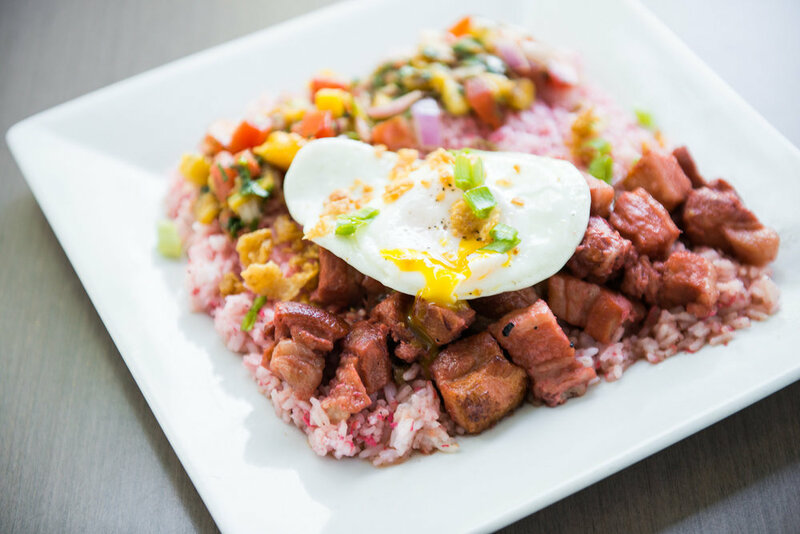 Look for Inay Kitchen’s menu of bangus silog, binagoongan rice plates, pork bbq with pancit, and kimchi fried rice at the UNDSCVRD Night Market on August 18 at the Old Mint.